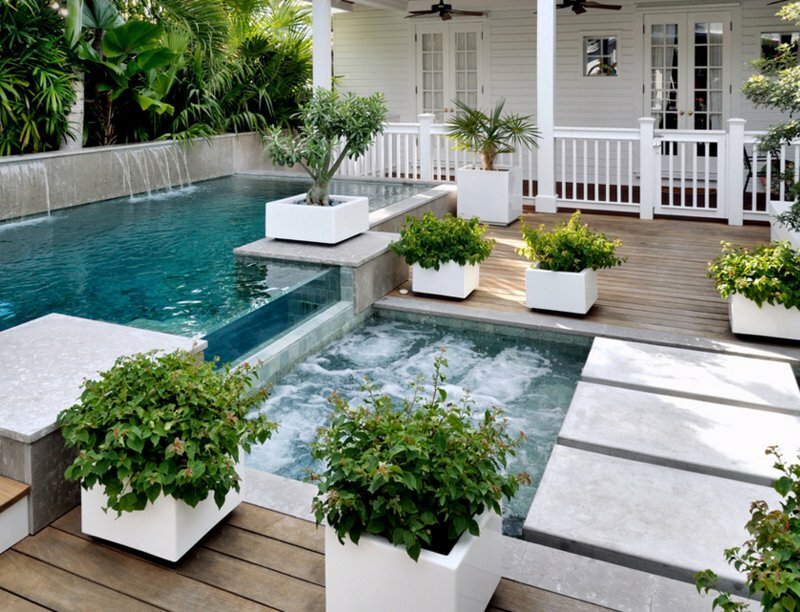 Add planters by the pool to give it a lovely refreshing appeal. For people who are into plants – whether they just purchase them or plant it themselves, planters is may be second to the most important thing that they need after the plants themselves. 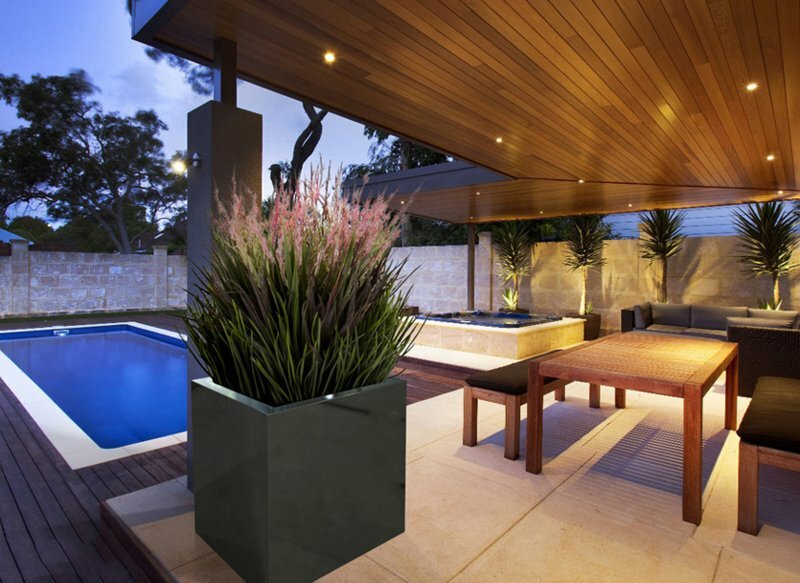 As we featured before here in Home Design Lover, there are tons of planter designs that are available in the market. They come in different designs, sizes, manufacturers and designers that actually are pretty. There are even those that look collectible because of how minimal the number of the planters is in the market. 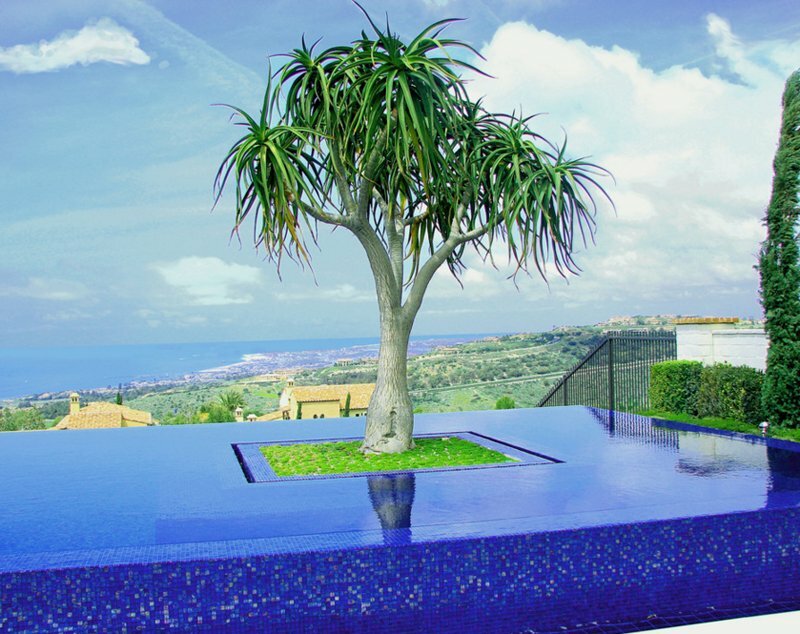 Below is a list of 20 Gorgeous Planters by the Swimming Pool that are pretty much contemporary and something that you can see in the market every day. Some of the designs are really neat and expensive-looking while others look simple but really fascinating. Take a look at the designs below and tell us what you think about them. This large planter is named after the Greek goddess of wisdom. The color and shape is very sleek and modern and the addition of the cute plant in here made it look more beautiful and interesting. I personally love the color of this Athens planter from Decorpro. The circular planters we see in here look really nice with the cute cactus plant that they added to it. It’s nice because a cactus is not high maintenance and still it looks really good. The contrast of the color of the planters and the cactus sure is common but always a neat idea! The wooden planters seen in this outdoor area are simple in design but it surely complements the overall theme of this swimming pool area. The plants used in the planters area well-kept and I like them. This country home has a wonderful outdoor area with tons of greenery and they’re all pretty! The large trees on the background promise a beautiful landscape behind it. The colorful plants in this outdoor area are really beautiful and something I’d want for my own backyard. The cube planters by the swimming pool seem to have grasses in them. I am not really familiar with plants that you use in spaces like this one; but I love the idea that this space is decorated with white planters – white sure is something that you will never go wrong with. This is one large outdoor area – a large swimming pool is the center of attraction in this space. The fact that there are tons of large trees in here, I would like to believe that this home is not located in the city. There are a lot of planters in here and they look all too pretty. This looks like a rest or vacation house that you can see in movies. The design of the house is a bit traditional but the outdoor space looks really gorgeous! Whoever added the plants in here, made sure that it is pretty but easy to maintain. This black and white house is quite intimidating. 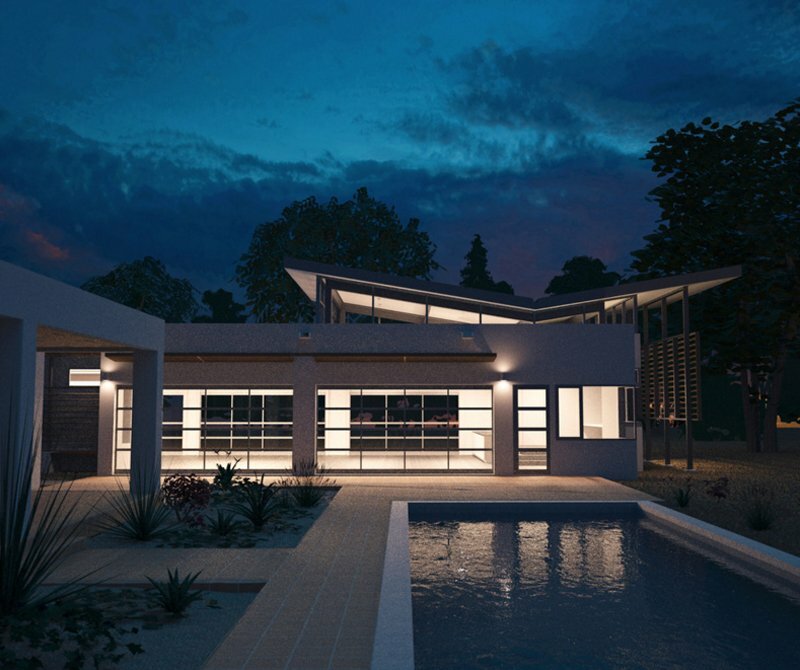 I do not know if it’s the columns or the small swimming pool – but aside from looking really expensive, this Hilltop modern home sure is sophisticated and classy. The color and the design of the planters in here sure look really glamorous! This outdoor space is surrounded by tons of plants and flowering plants. 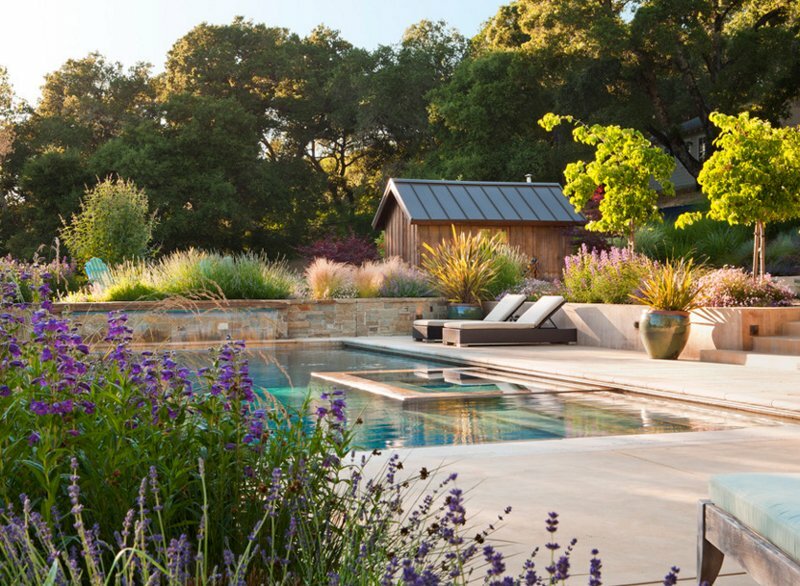 Most of the plants by the swimming pool is low maintenance so it wouldn’t be hard to manage. Well, this is one beautiful infinity pool with a cute accent in the middle. Well, it’s not really an accent but a stunning plant that surely looks very fun! If I had this space and have a view like this one – I think that it is just wonderful. 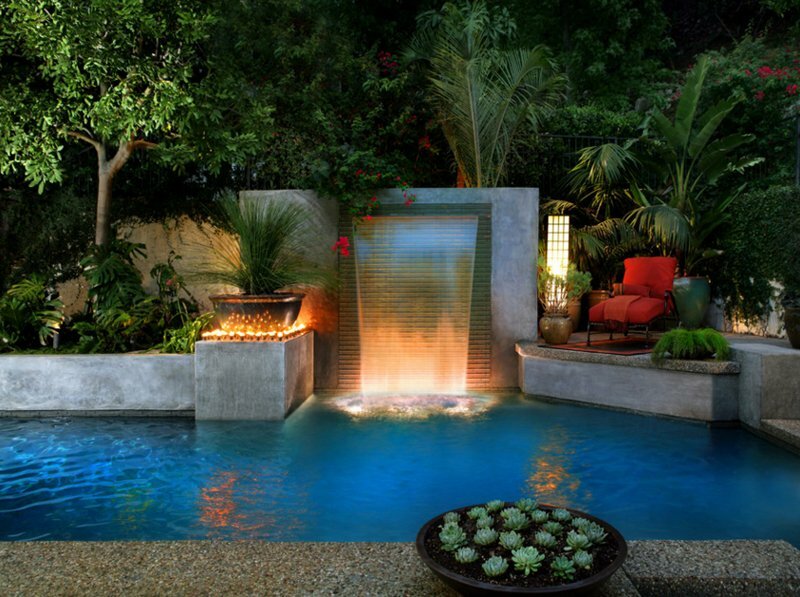 Want a cute waterfall effect on your swimming pool area? This is one great idea you can ask your designer to add to your outdoor space. I love the fact that there are plants around the pool, although I think that there are a lot of them in here, it still looks fascinating and Earth-friendly. 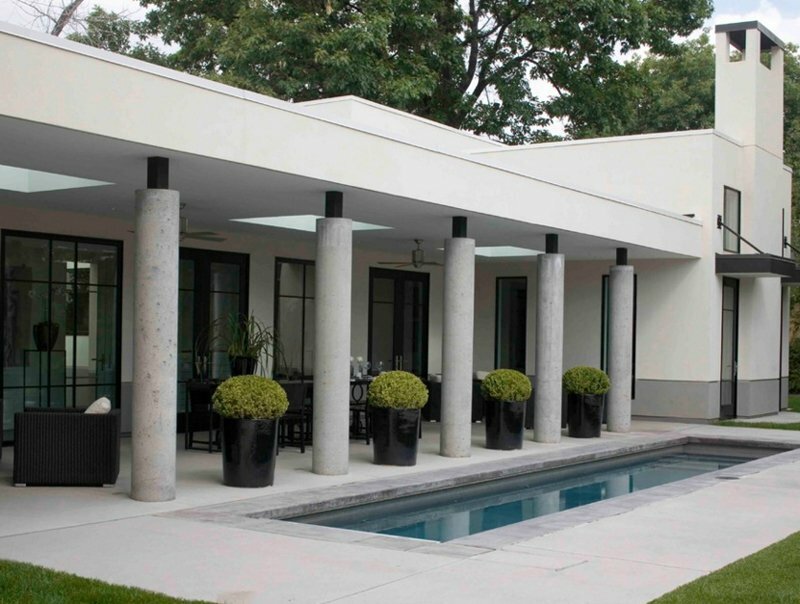 In this home, for example, the planters around the swimming pool sure is great because of all the concrete in this property, a little green area would very much nice for it. I do not really know the size of this pool, but it sure looks enough for a short swim every day. It’s background seems to be in some mountain or something and adding the plants on the corner of this property seems very abundant; the fact that it looks crowded seems to imitate the feel of mountains or forests. Fancy a mansion-like location? This looks like the space you are looking for. This home sure is large and very telenovela-like and very interesting because of the said look and feature. 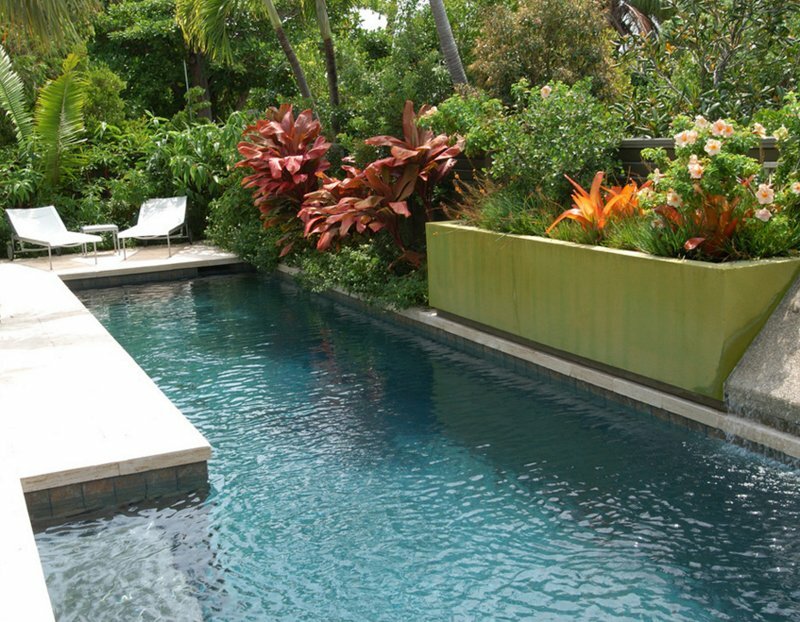 The shrubs that are surrounding the pool is cute and looks like its really well-taken care of. This place looks really charming because of the lighting from the inside of the house that seems very ideal for cafes or coffee shops that use mood lighting. The design of the house is also really beautiful – and with a beautiful scenic and background in here, this is definitely one astounding space. Note the spherical planters that are on the sides of the pool. 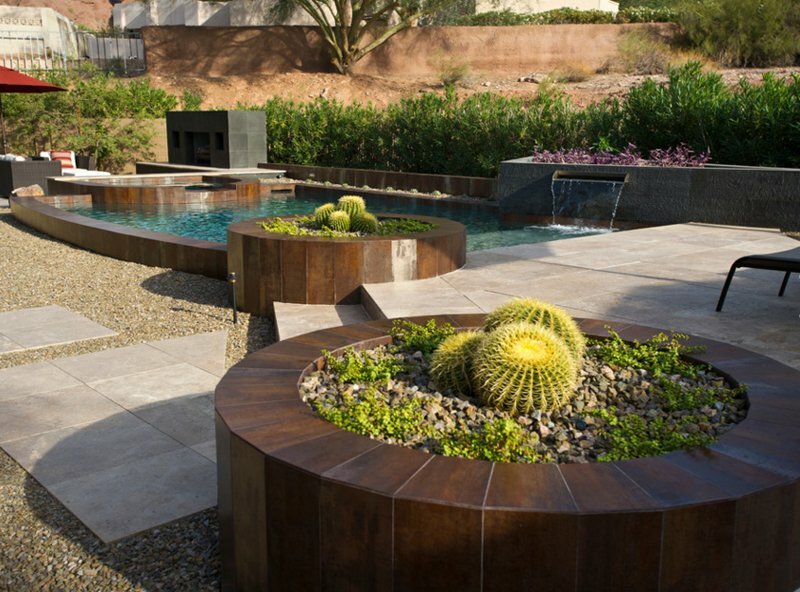 Fancy and desert feel in your swimming pool area? From what I can see, the insides of this guest house is still empty, plus the planters were somehow made into large planter boxes to place all the plants on it close to the pool. The aura of this outdoor at this hour seem interesting and a bit spooky. 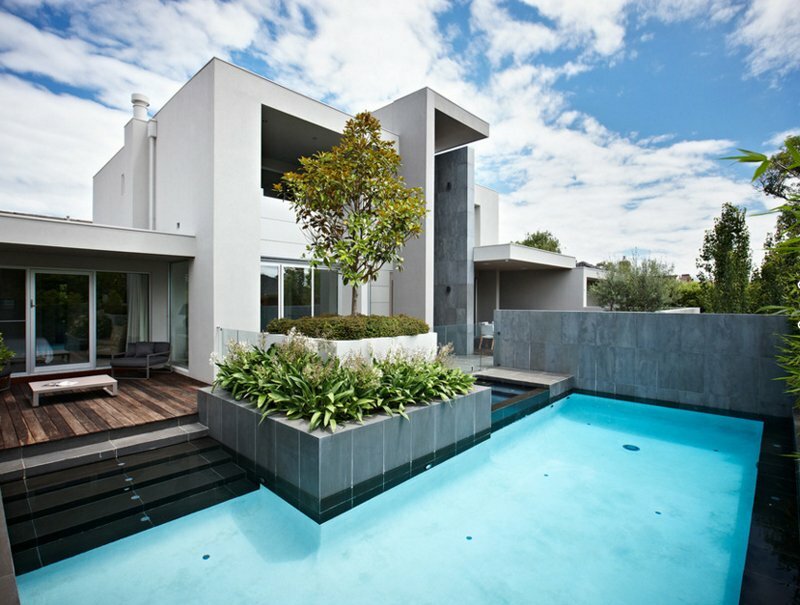 A cute rectangular pool which is adorned with tons of plants around. From this angle, the look of the facade of the house plus the roofing looks something that you can see in places like Rome; I know it’s not always the case but I think this facade looks romantic and really pretty. Well for a residential space and pool, I wouldn’t really expect having palms this big as a landscaping plant but if you the place rarely sees palms or that the owner actually loves places with palms, this outdoor sure is ideal and even perfect. I think every now and then, fallen leaves would be an issue, but if you have someone to maintain it, then there’s no problem! Envision using shrubs but in a vase or planter? 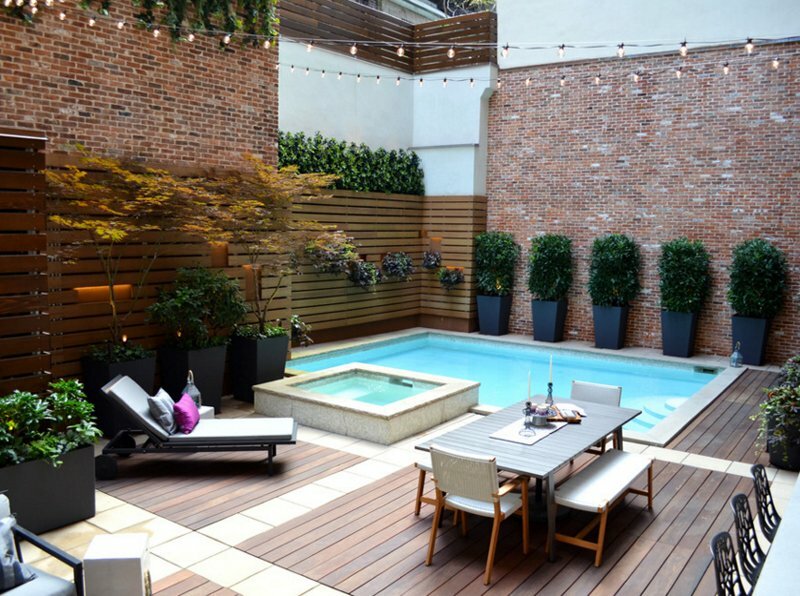 Take a look at what they did with the plants in this pool garden in Tribeca. The brick walls added drama to the spaces and the wooden floors seem really neat that completes the look of this space. Interested in adding a couple of planters by your swimming pool? This sure seems to be the answer to that. The look is simple but very contemporary. The planters may look simple because they are ordinary cubes or squares and white, but I think the look in here is just perfect. What do you think about the 20 Gorgeous Planters by the Swimming Pool? Aren’t they beautiful and nice to look at? 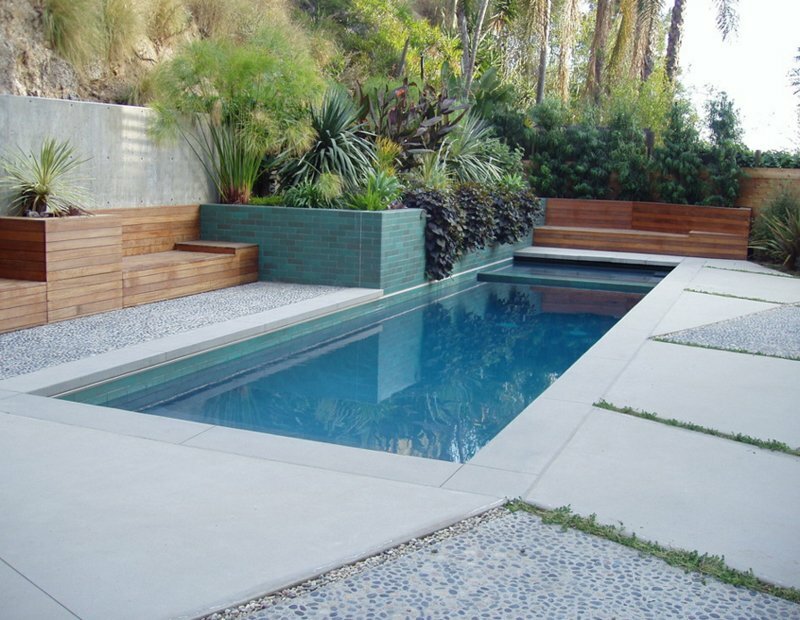 All of the planters that we featured in this list sure complemented the swimming pools and the outdoor space in general. Some may be simple but all of them are pretty. If you liked this list, you should check out the other planter design to decorate your space that I collected before. More to come in Home Design Lover! What out for it guys!